Feng shui is the art of influencing our internal state by arranging our surroundings to promote wellbeing and success. Though feng shui is an ancient practice, modern psychology consistently confirms that our environment affects our emotions. Case in point: when people are around happy people, they tend to have more energy and feel less stressed; increased humidity reduces concentration; sunlight lessens tiredness. But emptiness isn’t the goal. 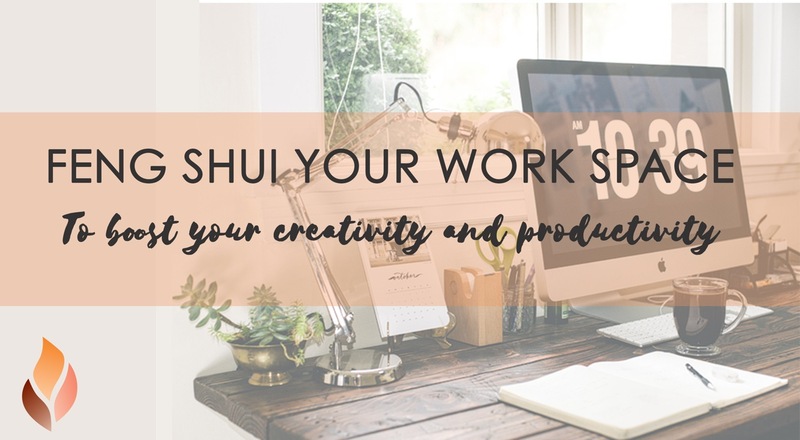 Feng shui experts recommend 50 percent of your desktop be occupied, while the University of Minnesota found that participants at a messy desk came up with more imaginative uses for a ping pong ball than participants at tidy desks. Consultant Craig Knight likewise argues that people—as animals with basic needs for enrichment and stimulation—shouldn’t work in “impoverished spaces”. Experiment with the best balance for you by periodically moving things around. Feng shui also advocates altering our position in the room for maximum command over our environment. For example, we shouldn’t sit with our backs to the door, and we should sit with a wall directly behind us. “Commanding Position” isn’t available to everyone, but we can still embody it with the right posture. TIME Magazine writes, “slumping makes you sad“, citing research that sitting up straight lifts your mood. Other findings suggest that erect posture gives you more confidence in your thoughts. The key is to be conscious of how you’re taking up space in the room. Play with different positions and notice how they impact your work. I try to adjust my posture every time I get up to take a break. Both psychology research and feng shui advise using or mimicking the natural environment in one’s home or office. Feng shui recommends natural light or spectrum lighting that simulates daylight for better visibility, health and productivity. By the same token, research has repeatedly shown that office plants lower employee stress levels while reducing office pollution. Feng shui encourages working in spacious, open areas without jagged angles or sharp corners. Similarly, a 2007 study found that higher ceilings were associated with “a more abstract and relational thinking style that helped participants see the commonalities between objects and concepts.” And a 2011 study found that undergrads looking at pictures of room interiors preferred those with rounded, as opposed to rectilinear, furniture. Another study found rounder spaces triggered more activity in brain regions associated with reward and aesthetic appreciation. Even the colors around us can impact our productivity and wellbeing at work. For example, green is associated with renewal, fresh energy and new beginnings in feng shui. Likewise, green has been scientifically shown to enhance performance on tasks that require generating new ideas. But don’t stress about the specifics. The exact details of feng shui may be less important than how we feel about what we do create. The simple act of making your own decisions about how to organize your workspace is beneficial. In one study, workers given the opportunity to arrange a small office with as many or few plants and pictures as they wanted were up to 32 percent more productive than others not given this option. Another study notes that anything we do to our workspaces “depends crucially” on how we perceive it. When I sit down at my desk every morning, I take stock of the beautiful office I’ve created. My back is to the door and my office is the size of a half-bath, but I’ve chosen and arranged all of its contents and that feels good. Calling it ‘feng shui’ or not, we can craft who we want to be and how we want to feel by consciously tending to the space around us.